Managing the finances are already a job in itself. Sometimes life has a way of punching you in the face and one of those times can be loosing a spouse too soon. No one can ever be prepared for that. 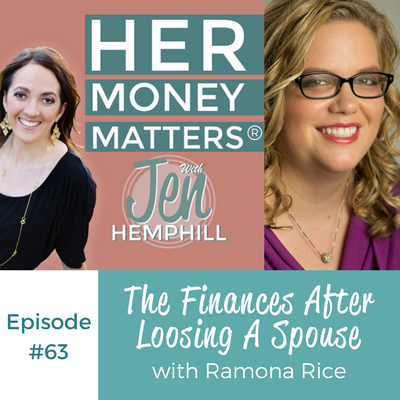 Ramona Rice shares her experience of loosing her spouse unexpectedly and how it has affected the financial side of her life. She will be sure to inspire you, make you laugh and tear up too. The challenges she is still dealing with 6 months later. What was your takeaway from this episode? Be sure to share in the comments below! [00:00:26.6] JH: Welcome, welcome. I’m so happy to have you here and as usual, I am grateful that you chose this podcast out of the thousands and thousands of podcast to choose from. So I really, really appreciate that. Now it has been a busy couple of weeks here as we wrap up and roll now for the Fearless Money Sisterhood monthly membership program. I love everyone’s support and excitement. Those that joined, I’m so happy to have them in there and I won’t be opening it up again for another couple of months but the good news is that you can still join our free community if you haven’t done so, over at jenhemphill.com/community. Now today, we continue the August theme of the different life situations and how it applies to money. And today, our special guest is going to be talking about just a really difficult topic, about becoming a widow too soon and I know that she is going to inspire you, make you laugh and tear up too. Now what you’ll learn about in today’s episode, the surprises she encountered, becoming a widow that no one warned her about, the best advice she has when losing a spouse too soon. The permission she has given herself that has given her some peace and the challenges that she is still dealing with six months later. Now let me share with you a little bit about Ramona. Ramona Rice is a professional content marketer who hosts the popular Sports Gal Pal Podcast where she helps people share their own love of sports. When she isn’t working, she’s usually hanging out with her tiny humans. Now I’ve gotten to know Ramona a little bit and like I mentioned, she is this powerful, dynamic woman that lives on apologetically. So I know that you’ll enjoy this interview. So let’s not delay and let’s go ahead and meet Ramona. 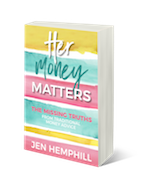 [00:02:34.3] JH: Welcome Ramona Rice to the Her Money Matters Podcast. I am stoked to have you here and I’m really, really grateful that you’re here to share your story. [00:02:43.8] RR: It’s my pleasure Jen and I’m sorry I was such a pain booking. You were so patient, thank you. [00:02:50.2] JH: Oh no problem, things happen. It’s life, it’s life. So I wanted to start off so we can get to know you better and tell me a little bit about how you grew up around money, your money story. [00:03:04.9] RR: So my money story is really as a child two parts. So my parents, my biological father and my biological mother, were stupid with money and he was enlisted in the Navy and they just spent, spent, spent and were in debt and it was bad. There were times where we had churches feeding us. Then they got divorced when I was about 11 and then my mom marries my stepfather and he’s super rich. So literally it was overnight, like a big house, pool, really ritzy neighborhood like in an instant, it was crazy and so it’s an interesting perspective because money can sometimes trigger panic in me but I’ve not been around someone who really manages his money very well. So it’s an odd kind of — I’m almost like Jekyll and Hyde when it comes to money because of the way I was brought up. [00:03:58.5] JH: Right and so in growing up, so you had the experience with your biological parents, then your mom remarried and so what did you learn from both scenarios or just from observation or from them talking to you about money and maybe your stepdad sat down and talked to you about money, I don’t know, share with us. So those are the lessons that I learned. I had to realize as an adult and I still struggle with this, that money is merely a tool and it could do really good things or really bad things. It just depends on how we use it and sometimes I think we put a little bit too much emotion on it and I am very guilty of this. [00:05:07.1] JH: We all are. [00:05:07.9] RR: Yeah and it’s hard not to be because we automatically assume, oh if you have every ounce of money in the world, you have no problems and Biggy Smalls is like, “No, more money, more problems,” because it’s true. It’s just different problems. So for me, the biggest thing was my parents honestly, my stepdad tried to teach me how to budget, I didn’t get it and it wasn’t until I was really an adult and on my own and in credit card and student loan debt that I finally was like, “Okay, I need to get it,” and I had to as an adult to learn even with such good role models. Sometimes you just have to go down that path. [00:05:40.9] JH: Yeah, sometimes it’s about experiencing it on your own and sometimes you just don’t get it right away. I’ve been guilty of that too and my parents told me this and that and until you experience it and experience the pain sometimes. You have to fall flat on your face sometimes to learn these lessons unfortunately. As much as we want to teach people or as much as our parents wanted to teach, sometimes that’s just how life is. So Ramona, you recently lost your husband and again, my condolences and I’m really grateful that you’re willing to talk about this because I know it’s going to help other women who’ve been in your shoes or those of us because you don’t know. [00:06:24.1] RR: No, you don’t. [00:06:24.7] JH: What you have to do, life changes in a snap of a finger. So I definitely feel this is such an important conversation to have even though it’s a difficult one to have. [00:06:36.1] RR: It is. Yeah, he died six months ago of a stroke and I tell people within six hours, I was a single mom. I mean six hours. I mean I woke up, we were supposed to fly out to a podcasting convention because I am a fellow podcaster like yourself and I was supposed to go to a podcast convention and my world, again in six hours, he’s gone and so everything changes. Everything. [00:06:57.9] JH: Everything, oh my God, just unimaginable. So tell us a little bit about how your money was managed before and then how that has changed? [00:07:10.7] RR: So my husband, James and I, when we first got together we were really stupid. We were just stupid with our money. We had credit cards and we were like, “Oh we’ve got credit cards, we can just spend everything,” and we didn’t have savings and it was stupid and once I had a baby, I quit my good steady job suddenly and then in 2007, I thought I would be a real estate agent. Well in 2007, the real estate agents, everything collapsed so long story short, we were struggling money wise. We made a decent amount of money and we just did not manage it well. So what we did was, I kept hearing on the radio this guy, Dave Ramsey, I’m sure you’re very familiar with him, your audience is very familiar with him. I love him and so I started listening to his radio show and I’m like, “This guy makes a lot of sense.” And my husband was never one to take classes and courses and things like that but I convinced him, “Let’s just do this.” In our area, there was literary only one class because they are typically done in churches. It was back when it was just now starting to get really popular so back in 2009, early 2009. So we go and we take the class and it was life changing because here was this guy who in very simple terms explained, “This is why you save. This is why credit cards are bad, this is why you need to live on a budget and this is how you do the budget. This is what investing is,” and it was just really simple and there was something really attainable and we were able to really hone in and we got really serious quickly and we liked it so much for a while there, James and I together at our church. We brought it at our church, we loved it so much. [00:08:40.4] RR: It is but then we slipped and that’s what happens. It’s like a diet program. You loved the diet program, you’re an evangelist for the diet program then you slip because I decided to go back to school and I had to make a decision, and I took out student loans. And for me, it was the right decision and I don’t regret it but it’s definitely wasn’t a Dave principle and so we bought a house and things like that in ways he wouldn’t have wanted us to but it made sense. But we still understood somewhat how to budget our money but the way it worked was that James would set up the bills and kind of set up the budget and he was really about communicating exactly how much we were supposed to spend on groceries and things like that. So we never seemed to catch up with that, to hold that snowball thing where unless we were both working on it together and towards the end of our marriage before he died we made the decision that we wanted to buy a bigger house. So we were upset in the current one that we bought and it’s a good investment. So we moved out of there and for a year, we lived with my parents with my kids and they had enough room and so we were able to rent it out and I’m so thankful I did that because my kids and I are still here because it makes so much more financial sense for me to live with them and also just the support for my children particularly as we’re all grieving when daddy died. So because of that and because we got really serious the last six months of his life, really paying down a lot of debt and I mean a lot of debt. So that was exciting and it’s weird. I tell people when they ask me, it was like the last year of his life, we were preparing for him to go and I didn’t realize it and it’s amazing. I started, again, I got into podcasting and started realizing hey, I don’t really want to work for a corporate job, I wanted to start my own business. So we were working towards that. That was the whole goal of this, it is doing that and so now, six months after he died, I’m doing that. I am not working my nine to five. I quit and we’ll go into the financial reasons why. So he would manage it and he would make sure the bills are paid on time but strategically wise, I tried to tell him this is what I want to do and I thought my way is the right way and I think he did it but he didn’t do it but he handled the day to day money management of our money. So he was the guy, it was very 1950’s. He had the passwords and it wasn’t like I couldn’t have access to the money, I just didn’t want to. Again like I said, money scares me. Money was a trigger growing up, I didn’t want to deal with it and he knew that and he was fine updating Quicken and doing Excel spreadsheets and he was happy. [00:11:08.4] JH: That’s great, it’s great that he was doing that and then he also mentioned you didn’t know the passwords. So you just let him. [00:11:19.3] RR: Yeah, I just let him handle it. [00:11:20.8] JH: You let him handle it. So then the unbearable happens, so what has changed now because you didn’t know the password, that’s what just caught my ear. Was that a challenge? [00:11:39.6] RR: For some things, yeah and I am still dealing with some of it. So what happened was is that we had to luckily, we bank with the local bank that my family is invested in. So we’re higher up in the local bank so we know a lot of the people. We brought a lot of business to this local bank so they were very accommodating and getting everything transferred over into my name and everything that needed to be done so I could have access to it. We had our bill pay system within the bank and they custom built it for me so I didn’t have to re-enter in all those accounts, they just moved it over and it took two weeks for them to do that for me but they did that. I was so lucky. [00:12:16.2] JH: That is great. So I do that just because again, as I’m adjusting to my life without him, the last thing I want to focus on is money to be honest, and it’s an important one. Things like I need to get health insurance and we found out actually he had lost his health insurance, his company was failing and they weren’t paying the health insurance. [00:13:19.5] JH: Oh my goodness. [00:13:20.0] RR: They hadn’t paid it for a months. Oh yeah, that was the surprises. It like, “oops, surprise!” And he knew about it and he didn’t tell me and there was a lot of things money wise he didn’t tell me because he didn’t want to worry me. [00:13:35.9] JH: …he was trying to protect you in a way but. [00:13:38.5] RR: It made it worst, it made it a lot worse because then I’m angry at him going, “Why didn’t you treat me like a grown up?” And it’s those kinds of things and he has a PayPal account. I’ll give you a really simple example, he has a PayPal account that I cannot get access to for whatever reason. PayPal has been such a pain about it but I started a business where I am getting paid by PayPal and I really want this PayPal account to be linked to this bank account because this bank account that I’ve had is since I was 16 and don’t pay any fees on it at all. So I don’t want to open a new checking account but I’m probably going to have to open a new checking account. I probably would have to anyway because it is a business but it’s just a sheer logistics of it is what I’m saying. So the biggest advise I can give anybody, I’m 36 years old. I was not expecting my husband to die of a stroke at 37. So the biggest thing I’m going to tell you is today with your partner, whoever else manages money with you, get the password somewhere, write them down and put them in a security deposit box at your bank. Get them somewhere where everybody knows where everything is. List out everything because you don’t know what’s going to happen and it will take you a couple of hours to get all this stuff organized but let me tell you, when you have something like this happen and you’re having to make such details right away, you need to have a plan because I think I remember, I think it was Dave who said this, “Don’t make any major financial decisions for a year after you lose someone,” and he’s absolutely right because you’re out of your mind. [00:14:59.9] JH: There’s a lot of emotion going on so you don’t want to deal with the other details. Trying to focus of taking care of you and taking care of the kids and their emotional needs. [00:15:11.7] RR: Right and then you get hospital bills and making sure the death certificates are sent to places. I’m very lucky that my parents have gone through the deaths of their parents so they knew how many death certificates to buy, you want at least 10 to 12 and they’re not cheap but you’re going to need a dozen. I applied for social security benefits for my children immediate at March, he died in February, it’s July and I still haven’t gotten them. And so you’ve got to prepare for there are going to be delays and so much red tape and if you are a person like myself that gets bog down by that, get with somebody who’s really good at dealing with that. For me, it’s my stepfather and for whatever reason, he’s so good at these details. Enlist a friend, enlist someone you trust that can help you with some of these things because you’re just not thinking straight. [00:15:56.0] JH: Right, oh my gosh. So your surprises were from passwords to the health insurance, the costs of the death certificates. [00:16:07.1] RR: Cost of the funeral. He was cremated, it was about $6,000 altogether and the surprise of how generous people are. I was amazed when it happened, one of his childhood friends started a Go Fund Me page and my children and I got almost $12,000 it was crazy, but it was so nice. I’m not even going to lie and it was needed. It was needed because I knew I had a buffer, I knew I had a little bit of faith again because of his health reasons, we couldn’t get life insurance for him. I have two policies, one for each child now because of that, because I am so terrified that if something were to happen to me, I want them to be able to pay off the house so they have that investment and they’ve got enough so that whoever takes care of them and then I’ve got a will so I know who will take care of them because I’m it and she just turned eight and he’s nine. So they’re little and so it’s these kinds of things. And these are things that we don’t want to talk about. They are so important and if you love the people that you’re with, you will have these plans in place so that if the unimaginable happens, they could focus on the healing that they need. So again, I am very lucky. I have an amazing support system and family that loves me and that has enough common sense and connection to get the things I need but so many young widows do not have this. [00:17:28.0] JH: Right and that’s great that you have. I just can’t imagine not having a support. I can’t imagine it to begin with and then to not have that support around you, of people that can help you with those details. Things that you weren’t expecting, that we don’t think from a day to day so that is definitely a blessing and what are some challenges that you are experiencing now? I know you’ve touched upon some of them but I don’t know if you want to speak to some others? [00:18:05.5] RR: Yeah, so one of the challenges right now is my income because I made the decision after talking to my parents, I looked at how much I was making at my job that I liked but I had to commute a long way, almost an hour back and forth, which was fairly long and after I took out their health insurance plus child care, it made no sense for me to work outside the home. It made no financial sense so I made the decision with my parents. This summer the kids needed me. We just needed the three of us to spend as much time together and so right now, I am building a private client list because I am a content marketer. I’m paid to be the community manager podcast website so that’s income and then I am launching a new company called Spapreneur, which I am very excited about but it’s still a lot of money going out just to start a company and then no money coming in. So that was one of the biggest worries. The challenges of dealing with social security. You cannot rely on it, eventually I’ll get my benefits but we’ve had to contact our senator and he’s had to get involved and that’s a shame. It’s a fairly simple thing if you think about it. There’s no way to not — he’s definitely dead. I’m going, “Hello?” This is a pretty — I’ve sent everything in, so just dealing with the red tape of the social security has been very interesting. It’s little things that pop up, bills you weren’t expecting. [0:19:54.8] JH: It adds up though, those little things can amount to a lot and just stress and frustration. [0:20:01.6] RR: Yeah, so what I’ve decided to do is honestly is just not panic, not make any major decisions right now, keep the plan that he and I were following before he died. So I didn’t make any changes. We are planning on me quitting my job anyway to stay home with the kids this summer so I did that. We were planning on me launching this business, I’m launching it, it starts September first. We were planning this things and eventually it will all work out. Right now I have a roof over my head, the children are fed, we’re fine, I can afford health insurance, I’m one of the few people that’s like, “Yay Obama care.” I’m one of the few because I’m going… otherwise I wouldn’t be able to afford it and that’s the truth. Apparently I’m a unicorn but whatever. Those sort of things. So I think for me just taking the breath and going okay, get the bills paid that you know you that need to be paid each month, make sure Netflix is paid so you can watch all your fun shows to keep you happy. You know, it’s those little things and then making sure each month, budgeting for expenses, doing my savings and just remembering that it’s all on me now. There’s also a freedom in that. I don’t have to now — I don’t have a partner who is like, “Well I want to do it this way. I get to do it everything my way.” There’s kind of freeing about that and exciting. [0:21:20.3] JH: That’s some great insight there because you don’t think about those things until they happen and I think it’s great what you're doing right now. Take care of what you need to take care on the finance like you're doing with your money and then in due time, you can do other things that you need to do with the money but I think right now what you’re doing focusing on is enough. Especially because you’ve got so much on your plate right now. So I think that’s wonderful. Tell us a little bit about the Spapreneur that the business that you’re launching in September, I’m curious. [0:21:55.6] RR: Sure, my family actually owns a very large successful day spa here in Virginia where I live and it’s been open 20 years. So we’re taking all the systems, all the processes, all the things that we’ve learned over 20 years on how to run a day spa and we’re packaging it up together. [0:22:34.8] RR: It’s those kind of things. There’s not too many people really serving this markets so I’m really excited about that. [0:22:40.7] JH: That is a great niche. [0:22:43.4] RR: I think so. We know it because we’ve lived it, my mom was my age when she started, there’s something nice and really comforting about that to know that she was the same age as I am. So she’s a silent partner in the actual business of it but we’re going to be hosting a podcast together so she’s going to be saying all of her fun stories because let me tell you, day spa’s yeah. [0:23:02.9] JH: I can imagine. [0:23:05.7] RR: You have no idea, when people take off their clothes, they lose their minds, that’s all I got to say. So after 20 years, you’ve seen some stuff and we’re going to take a lesson, like a story that she’s experienced and then tie a lesson into it, what people can learn from us. So it’s going to be a lot of fun, it’s fun because it’s almost her legacy so I get to celebrate that. Yeah, it’s a really fun project. So I’ve got a due date of September 1st, I put that up there, I’m part of a mastermind and so I put it out there, that’s the day and some fever working toward getting everything ready to go. [0:23:38.4] JH: Oh my gosh, that’s exciting and then a podcast with your mom and her sharing those stories, I have to listen to that, I’m all curious now. Even though I’m not going to be opening a day spa, not any time soon, unless for some reason things change. But oh my goodness, that is exciting, every exciting times. So tell me a little bit about the best money you’ve spent? [0:24:04.8] RR: Oh the best money I’ve spent was probably, we took the kids to Disney World in 2011 and the reason that was the best money we spent, it was about $11,000 altogether, some of it was a gift, some of it was us. We were celebrating me graduate from college, I graduated from the University of Virginia, go who’s. [0:25:03.2] RR: I’m so glad we did that because that was a big vacation with daddy. So any of those moments where we spent money to do something together as a family and then I’ve got one more. My husband and I invested every year. I’m a big sports fan, I have a sports podcast called the Sports Gal Pal and I’m a UVA fan through and through, despite them losing. We have season tickets every year for football, that’s the best money I’ve spent for our marriage, partly because our marriage was always strongest when we would drive three hours up and three hours back from Charlottesville because it was uninterrupted time without kids, without anything else and we were just talking and we’re hanging out, we were friends. So that was money well spent. Any money that you can spend with the people you love, it’s money well spent. [0:25:46.0] JH: I agree. I know you mentioned Dave Ramsey, would he be your favorite money guru celebrity? [0:25:52.7] RR: Yeah, I think so. I like his practical advice. Some of the stuff that he talks about, I think he’s a little too extreme. I think credit cards can be used responsibly because I do. I pay mine off. You get points, you get other things and I’m sorry they’re safer than debit cards online, they are because if I use my Amex online and if it’s broken into, Amex gives you back money where as the debit card, they may not. [0:26:15.7] JH: Exactly. There’s different protections. [0:26:19.0] RR: There is and you need to understand those. I like him because he explains it in ways that are fun, that are practical and he talks about which I really think it’s important to communication part of the marriage of that. The other person I really like money wise, I like the girl from the Today’s Show, Jean Chatzky. I think she’s — you can talk about her. You link her in the show notes. She’s great. She gives great practical advice, really smart. Again, sometimes also too, just ask your grandparents because a lot of them survive the depression and they know how to save their money. [0:26:54.8] JH: I like that point. Yeah, Jean actually has a podcast as well called Her Money. [0:27:01.9] RR: Well there you go. [0:27:02.5] JH: Yeah, awesome. How about, are you more of a cash person, I know you mentioned you use credit cards but what is your favorite way of paying? [0:27:12.2] RR: I use a credit card a lot and the reason why, there’s a couple of reasons. One for the business reasons, it makes it so much easier to have it all in one statement. So I’ve got obviously business cards and I got personal cards and just for me, it’s the security, when you carry cash around, it just — I know that there’s psychological triggers that if you pay with cash, it hurts more, it doesn’t hurt me more, it doesn’t hurt me more. I have no problems spending money. If I have money, I have money. Just having cash around just worries me because I’ll lose it. Whereas your credit card, for some reason I don’t lose. I like to use a credit card, plus again, because I travel a lot from my job, miles and things like that, it starts adding up. [0:27:49.6] JH: Right. For me, for some reason, cash, it feels like if I have it, I spend it and I’m not accountable to it and that’s how my brain works, even though not everybody’s like that. So I tend to do more, the debit and the credit for certain things but the cash for me because of those reasons, it just, if I have it, it’s just, I’m not accountable to it and I just going to spend it and I’m like, well that was supposed to be for groceries or whatever. So that’s my challenge for me for cash. Would you say you’re a saver or a spender? [0:28:24.8] RR: I’m a spender. Oh I’m a spender It’s funny, they don’t tell you this in grief counseling, you spend a lot of money because you have to fill up time because you don’t want to be home. So you go to stores. You’re like, “Here, I’ll buy new clothes because that will make me feel good.” I had like all the closet to myself now. I had to fill it. I did that and I don’t regret it. Some of it I don’t wear but I’m kind of going, “Oh, I probably should have made wiser decisions,” but whatever. I know it will work out. [0:28:54.1] JH: It will work out for sure. [0:28:54.7] RR: I am definitely a spender but I see the intelligence and the very — I value people who can save money. But I also don’t want to be, and it’s funny because I’m starting to date and I’m starting to see guys that are really generous and guys that are really stingy and I’m like, “No, we don’t like the stingy ones.” It’s okay to, like my step dad is a great example, he knows how to save money but at the same time he’s very generous when it’s time. I think that’s important. [0:29:21.6] JH: Right, absolutely. What advice would you give a woman that has gone through what you’ve gone through? What would be the best piece of advice? [0:29:30.9] RR: The biggest thing is again, find somebody who can help you make decisions without emotion. Your emotions are super high. When you’re dealing with grief at this level, you feel everything, you feel the highest joy, you feel the deepest, darkest sadness. The last thing you need is for money to get involved in any of that. You need somebody you trust and if it’s a financial adviser, if it’s your banker, if it’s like me, your stepfather or father figure, your mom or your sister, whomever it is, you need somebody that can unemotionally handle the money details for a while, it’s okay because you may not be in a state where you can or get it setup to where some things are just automatically paid, like the minimum, it’s okay. If you carry a balance, it will be okay. [0:30:16.3] JH: Right, it’s not going to go anywhere, it will wait for you, it will be definitely okay. [0:30:21.1] RR: You might spend more on interest in the long run, but you know what? It’s better to make a smart decision because for me right now, I could pay — I’ve got a little bit of a credit card balance because I’ve been traveling a lot. I could pay it all off right now from the funds that are liquid in my bank account but then I would have no cash reserves and for me, I feel like that’s very foolish right now. I’d rather carry a balance on a credit card right now than move my cash reserves because I don’t know if I’ll need those or not. You just don’t know. [0:30:47.4] JH: Right, and you’ve given yourself that permission and not feeling guilty about it, which is good because I think that’s something that we tend to do because you’re so not supposed to carry a balance, the things of what we’re not supposed to do with money right? Sometimes in our, I talk a lot about how personal finance is personal and unique but even though those, that advice has good intentions, they don’t know what you’re dealing with at the moment. They don’t know your particular situation. So you have to give yourself permission and acknowledge your situation like you’ve done and do what’s best for you at that moment. So I think that is great that you’re doing that. Well this has been so great Ramona, you’ve given so much, so many good nuggets, a lot of information that I think is going to be valuable for others and I really appreciate that. As you know, this podcast is about making money simple and taking control of it. How would you finish this sentence? Her money matters because _____. [0:31:50.8] RR: It equals freedom. When you have enough money in the bank, you get to make really good choices. The difference between a headache is having Aspirin or not. So if you have money, you have money to buy aspirin, if you have enough money, you have money to travel, if you have enough money, you have the opportunity to quit your job, so you can focus on your children while we’re all recovering from a major trauma and there’s the difference is that I was lucky I had a safety net that could allow me to do that. [0:32:18.4] JH: Beautiful, thank you for that. And I am going to be sure to put that info of where to find you for Sport Gal Pal, your podcast, the Spapreneur as well because I’m excited about that, I’m not even — I want to know the stories honestly, that’s what it is, I want to know the stories. What is talked about? Because I’m just imagining, I’ll be definitely entertained. [0:32:40.8] RR: You can’t even imagine some of the stories, some of it you just like, “You guys are making this up.” We could be a reality show, it’s really that good. [0:32:47.6] JH: Oh my goodness, I can’t wait. I really appreciate your time and sharing all that you shared with us Ramona. [0:32:54.2] RR: Oh it’s my pleasure. [0:33:01.2] JH: Didn’t I tell you Ramona was something else, right? I love her directness and just unapologetic way of being, and there was really something when we were chatting that really struck me and I’ll tell you why in a minute. But first as usual, I have to give a shout out. So this week, I’m doing a quick shout out to Yvonne, she is a member of our free, Her Money Matters community and this independent and super committed woman. I have to tell you, she is on a path, she’s determined to retire in 10 years, she’s being super aggressive and doing so. But I also wanted to tell you that when she stops by the group, she’s always stopping by with some sort of encouragement, she shares an interesting article, I really appreciate that about you Yvonne for just contributing to the group, the way that you do for your positivity is just really helpful. So I appreciate that Yvonne. Now, as far as what struck me was Ramona’s giving herself that permission to really take that one day at a time with her finances. She’s obviously paying the bills, paying the minimum, where she needs to and she’s fine with that. Right now, she’s not focused on getting out of debt as quickly as possible. She’s focusing on healing, she’s focusing on being there for her children because honestly, the money can wait, right? The priorities right now are the healing and being there for her children and just getting through or really can you get through this? I don’t know. But I wanted to bring this up because in life, sometimes we see these new stories around TV, about how much, how bad the debt is, how people aren’t prepared to retire and it gets us, and if we fit that picture, we get all upset or overwhelmed or get stressed about it, right? But sometimes in life you have to take care of you and that means giving yourself space in the brain to put the finances or getting out of debt, putting more into retirement, those things to the side and be okay with that. Because in Ramona’s case, taking care of her and those children and especially during this difficult time, comes first right? The money can wait. In due time, she will get out of debt in due time, she will do what she needs to do to get to where she wants to be financially and that’s completely okay. So I wanted to be sure that you get that message too because even, it doesn’t have to be losing a spouse, like I mentioned. Sometimes in life, depending on your situation, you got to be honest with yourself and I’m not giving you this message or telling you about this to allow yourself to make excuses. Absolutely not. You just have to have that heart to heart talk with yourself and you know what’s best for you, right? You know in your gut what you should be doing. So that aside, I just have to get that out there. 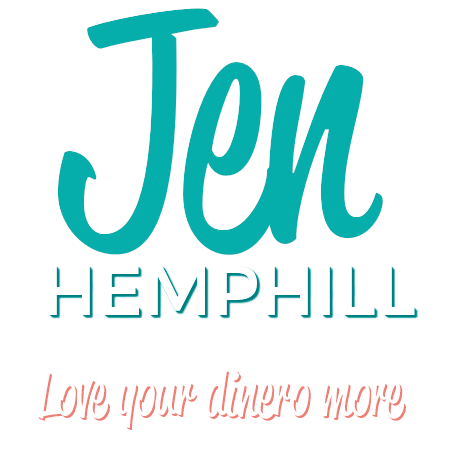 So that is it for today, it is a wrap, I appreciate you showing up today, listening to this episode and remember, join us in our free community at JenHemphill.com/community. Now next week, on the podcast, we talk to a guest who is a single woman. She is going to talk to us from the perspective of a single woman, so I’m excited to share that with you. I want to thank Ramona for joining us, for just talking to us about such a difficult topic. Be sure to check out the show notes on where to find Ramona, her podcast and all the good stuff that she’s up to over at Jenhemphill.com/63. Thanks again for joining me and I will talk to you next Thursday.